Eddie is a Larrakia man, and completed a Bachelor of Laws in 2002 and Masters of Laws (International Law and International Relations) in 2009. Admitted as a Legal Practitioner of the Supreme Court of the Northern Territory, professional positions include NT Legal Aid Commission in the areas of Commercial Law, Family Law, and Litigation, as well as Aboriginal Lands and Correctional Services with the Department of Justice. In 2002 he was elected to the ATSIC Yilli Rreung Regional Council, and subsequently became the Chair of that Council. Mr Cubillo is a former Chair of both the North Australian Aboriginal Justice Agency (NAAJA) and the Aboriginal Justice Advisory Committee (NT). 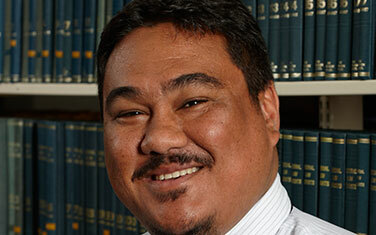 He is a Member of the Oxfam Aboriginal and Torres Strait Islander Reference Group, Indigenous Law Bulletin (UNSW Faculty of Law) – Editorial Board, and Member of the Judging Panel of the National Indigenous Governance Awards conducted by Reconciliation Australia. In 2010 Mr Cubillo was appointed the Anti – Discrimination Commissioner of the Northern Territory and his current position is as Executive Officer of the National Aboriginal & Torres Strait Islander Legal Service (NATSILS). In September 2015 Eddie was announced as the National Indigenous Legal Professional of the Year.